The B1on allows you to choose from 100 different onboard DSP effects. These include compressors, noise gates, filters, equalizers and octave dividers, as well as boosters, overdrives, fuzzes, phasers, and flangers, plus chorus, pitch shift, tremolo, vibrato, a sub-octave generator, and an intelligent bass synthesizer that plays along in key—even a DeFret effect that changes the tone of a fretted bass into that of a fretless. There are simulations of both classic and modern pedals such as the Aphex Punch Factory, MXR DynaComp, dbx 160A, BBE Sonic Maximizer, Moog MF-101, and Z. Vex Seek-Wah, as well as the Xotic EP Booster and Bass BB Preamp, Electro-Harmonix Bass Big Muff, SansAmp Bass Driver DI, MXR Bass D.I.+, Avalon Design U5, plus the ADA Flanger, tc Electronic Corona Tri-Chorus, and BOSS ODB-3, DS-1 and Metal Zone. Original effects include Zoom's Noise Reduction (ZNR) algorithm, a bass frequency-specific Auto-Wah, and a "talking" modulator. You'll also find more than a dozen delays and natural-sounding reverbs here, including rooms, halls, plates, and an emulation of the Line6 M9 Particle Verb. The dozen amp models include emulations of classic tube amplifiers like the Ampeg SVT, Ampeg B-15, Fender Bassman, Marshall Super Bass, Polytone Mini-Brute III, and acoustic 360, as well as the contemporary sounds of the Hartke HA3500, SWR SM-900, Aguilar DB750, Gallien-Krueger 800RB, Eden WT-800, and Italian Markbass Little Mark III, each with its own distinct cabinet modeling that can be used to further alter the tonal quality. What's more, you can pair any amp model to any cabinet model for unusual, and often striking, effects. Question: When is an effects pedal not just an effects pedal? Answer: When it's a multi-effects pedal. The B1on not only allows you to select and edit any of its onboard effects, it enables you to use up to 5 of them simultaneously, chained together in any order you like. This kind of power and flexibility means that you can create rich, complex effects within the unit itself instead of having to use multiple pedals. However, there are no hard and fast rules on how to chain effects. Exciting new sounds can easily be discovered with a little experimentation and some imaginative effect chaining. 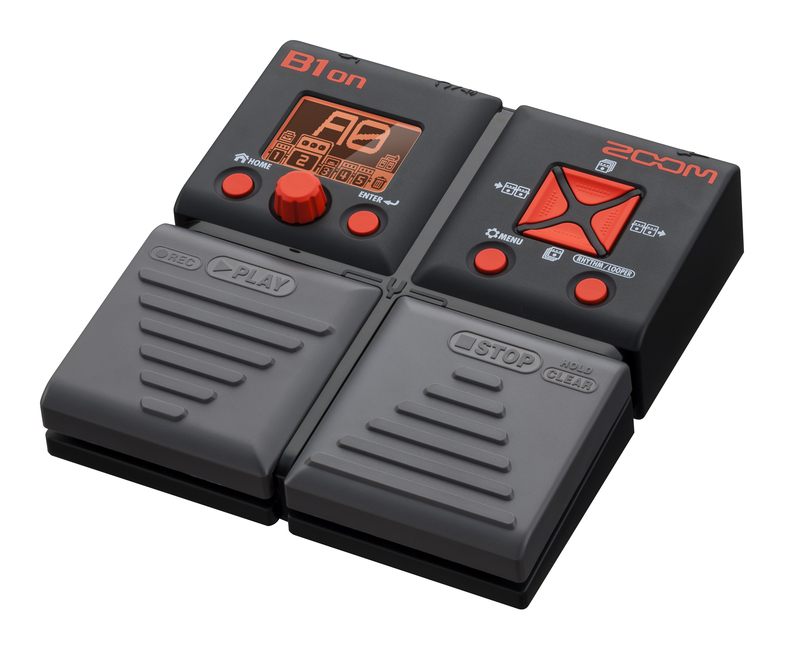 The B1on gives you the ability to get creative with your effects chaining. You can also easily edit chains you’ve previously created. Simple changes in the order of effects can sometimes alter sounds dramatically. For example, an EQ set before an amp model can result in a radically different sound than having the EQ set after the amp model. That's because putting the EQ before the amp model serves not only to alter the tonal characteristic of the sound but to act as a signal booster as well. All this can be done internally with the B1on—much easier than physically changing the order of stompboxes. Bassists know the importance of playing in tune. But it's not just about getting your instrument in tune; it's about keeping it in tune all night. 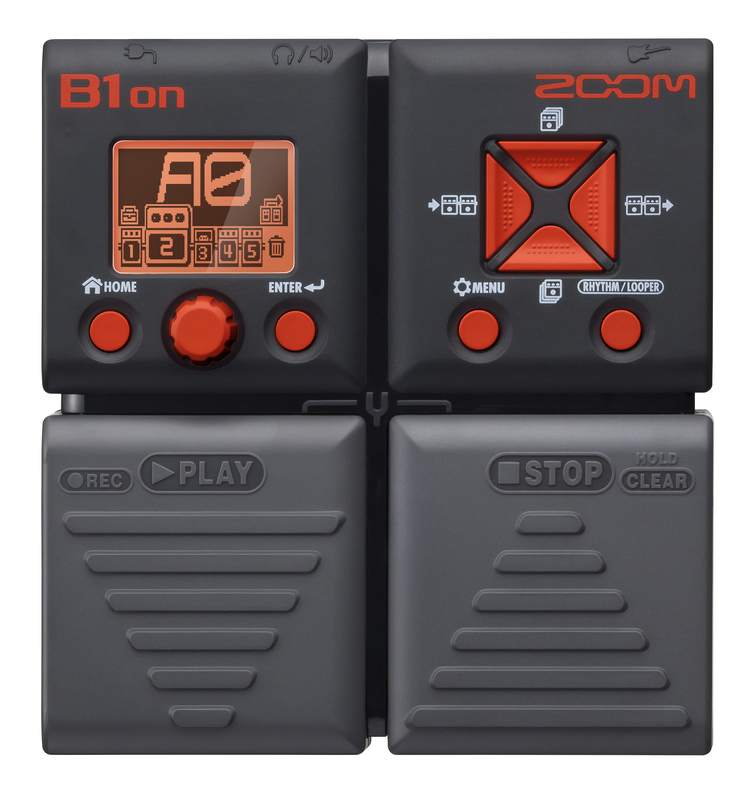 That's no problem if you're using a B1on, because its built-in Tuner makes the task totally stress-free, even under the pressure of a live gig and the heat of stage lighting. The B1on Tuner is instantly accessible at all times and shows you whether the note you're playing is sharp, flat, or dead on. You can opt to either bypass the currently selected effect (thus giving you a clean, unaffected sound) when tuning, or to mute the signal altogether, allowing you to tune in silence. 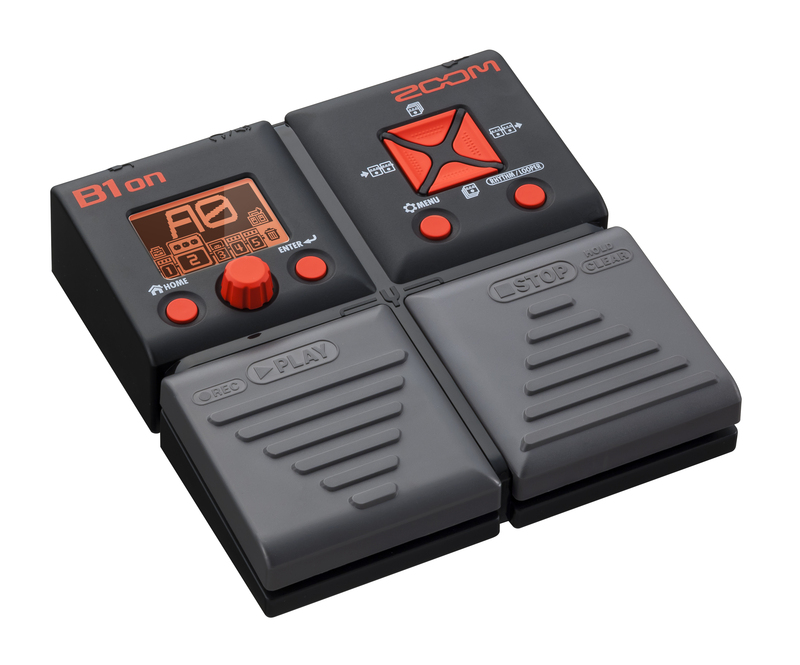 The B1on Tuner is flexible, too: It can be set to a reference of A=440, or any value between 435 and 445, and can be used chromatically or in a variety of standard bass tunings. Rhythm training is an important part of every bassist's craft. The B1on Rhythm function makes it easy and fun to do. 68 realistic-sounding rhythms are at your fingertips: PCM samples of actual drums playing real-life patterns in a variety of different genres—everything from rock to jazz, and from Emo to Motown. Dozens of quarter-note, eighth-note and sixteenth-note rhythms are provided, in 4/4, 6/8 (shuffle), and 3/4 (waltz time); for the adventurous, there's even a 5/4 groove! Got a great lick that you'd like to expand on, or a distinctive chord progression that you think could serve as the foundation for an exciting improvisation or an inspired solo? Explore your creativity to its fullest with the B1on Looper, which allows you to layer up to 30 seconds of performance (through the effect or effects of your choice) in high quality audio (16-bit 44.1kHz). Recording time can either be set manually or to a preset number of quarter notes, up to 64 beats, and starting and stopping the Looper (as well as readying it for an overdub or clearing its memory altogether) is as easy as pressing a pedal—no hands required. Finally got that perfect effect crafted, but afraid you'll lose it? It'll never happen when you use the B1on's handy Auto Save function. When switched on, whatever you change will automatically be saved. Alternatively, if you'd prefer the insurance of a safety net (so that you never accidentally overwrite a patch), simply leave Auto Save off. The B1on will then politely ask you if you want to save your edits whenever you move on to a different patch. Settings can be saved to the currently selected memory area, or to any other area, allowing you to place it where it's most convenient. The B1on makes naming patches a breeze, too—simply use the parameter knob to dial in the characters you want. Patch names can be up to ten characters long, and each patch can be assigned its own level as well, allowing you to ensure consistent volume even when going from a gentle acoustic sound to heavy metal overdrive. Normally, you'll want to store your custom B1on patches adjacent to one another so that stepping on the pedal will scroll through them in the order needed. In that circumstance, you'll also want the sound to change immediately, and this is the way the B1on normally operates. However, if you haven't stored your patches in adjacent memory locations, or if you simply get the urge to experiment and change things up in the middle of a performance, just turn on the B1on Pre Select function. This allows you to scroll through patches silently, with the current sound remaining unchanged as you do so. The B1on runs on just 4 AA batteries—either alkaline or rechargeable NiMH. Alternatively, it can be powered from an optional Zoom AD-16 AC adapter or via USB. When running on batteries, the B1on powers up automatically when a jack is inserted into its input connector, and a unique "eco" function can be used to automatically power the unit off if unused for 10 hours.